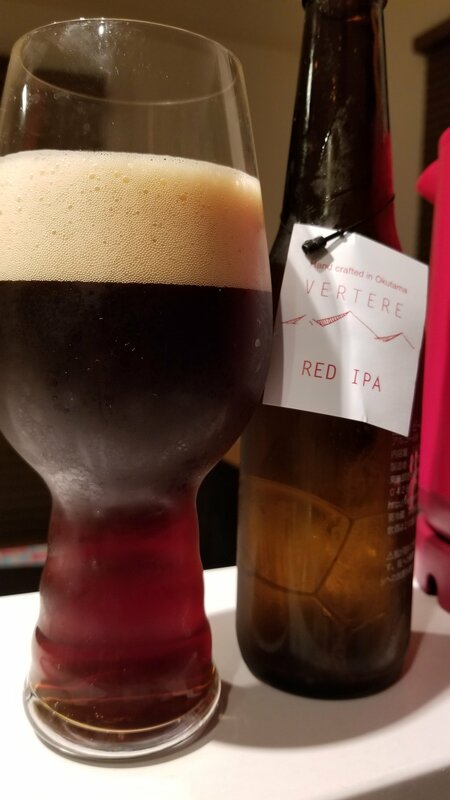 Vertere Red IPA is a 5.6% American IPA from Vertere, based in Okutama, Tokyo, in Japan. It’s part of their all-year round range of beers and can be found in both bottles and on tap. I randomly came across Vertere Red IPA when I was drinking in Tap & Growler – I had heard of the place but never seen the beers in bottles or elsewhere in other bars. Usually a sign that the beer isn’t good. Vertere Red IPA poured out a dark reddish brown colour with a slight tan coloured head that clung to the side of the glass during drinking. It had a fruity and piney aroma with a slight caramel undertone to it once the beer had warmed up. It had a bitterness to it at the start that opened up into an ever-so-slight sourness that wasn’t unpleasant but a little of a surprise. The fruity and pine notes came through, along with a caramel body to it. For something that looked quite dark, Vertere Red IPA didn’t have as thick, or as bold, as a body as I had expected. It finished off to be quite dry and fruity though drinkable. Vertere Red IPA is a good first effort from Vertere – looking forward to trying more.